Ghanaian President John Dramani Mahama has responded to a petition by the Media Foundation for West Africa and 155 Ghanaian journalists seeking disciplinary action against a senior presidential staffer, Stan Dogbe. The petition was filed in October 2015, following Dogbe's attack on a journalist. This statement was originally published on mfwa.org on 25 January 2016. Ghana's president, John Dramani Mahama has responded to a petition by the Media Foundation for West Africa (MFWA) and 155 Ghanaian journalists seeking disciplinary action against a senior presidential staffer, Stan Dogbe. In a letter addressed to the MFWA and copied to the National Media Commission (NMC), the Secretary to the President, Mr. Kwesi Quartey, communicated President Mahama's receipt of the petition and acknowledgement of the concerns raised by the petitioners. “I acknowledge receipt of your letter dated 14th October, 2015 addressed to His Excellency the President on the above subject. His Excellency has taken note of the concerns raised in the letter. He wishes me to assure the Media Foundation that due attention would be paid to the matter in the interest of protecting the reputation of the Presidency,” the letter from the president's secretary stated. The petition was filed in October 2015 following Mr. Dogbe's attack on Mr. Yahayah Kwamoah, a journalist with the state-owned Ghana Broadcasting Corporation. In the process, the presidential staffer seized and instantly destroyed a digital recorder of the journalist. After the attack, the MFWA issued a statement calling on the president to sanction his staffer as a way of demonstrating his intolerance of impunity for crimes against journalists and as a way of protecting the reputation of the Presidency. 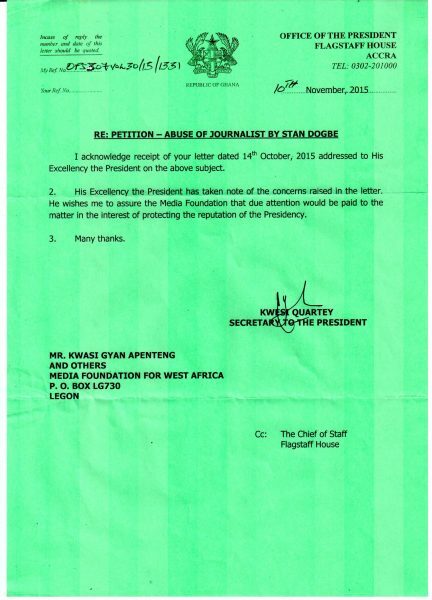 Subsequently, the MFWA was joined by 155 journalists to petition the president on the matter. The MFWA is pleased that the president has promised to pay attention to very important issues raised by the petitioners. “We are happy that the Presidency appreciates the fact that Mr. Dogbe's action has an impact on the reputation of the Presidency,” said Sulemana Braimah Executive Director of the MFWA. “It's been almost four months since Mr. Dodge committed the embarrassing act and one would have expected a swift action from the president to safeguard the reputation of his high office. I hope that the promise by the president to deal with the matter will not remain just a promise. I hope he will take action soon,” Braimah stressed. We reiterate our concern that the conduct of Mr Dogbe has a direct bearing on the reputation of the office of the president and the safety of journalists in Ghana. It is our hope that the expectation of the petitioners will be duly addressed. A scanned copy of the acknowledgment letter can be found on our website, www.mfwa.org.